An IndiGo Birding gift certificate might make the perfect gift for someone who is a backyard bird lover, nature enthusiast, or special someone that doesn’t need one more thing sitting around the house! IndiGo Birding gift certificates have been given as surprise birthday gifts, Christmas gifts, and for Mother’s Day. Click on the button here to select either a dollar amount or a specific tour that you would like to buy as a gift. If you have an idea for a customized gift certificate, please contact me. 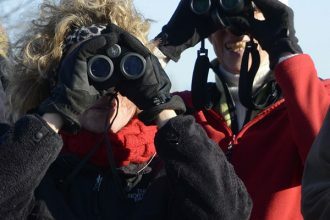 IndiGo Birding Nature Tours offers a variety of bird-related tours, classes, and camps. While based in Bloomington, IN, IndiGo Birding serves much of south-central Indiana and beyond. Come experience the wonders of birds!